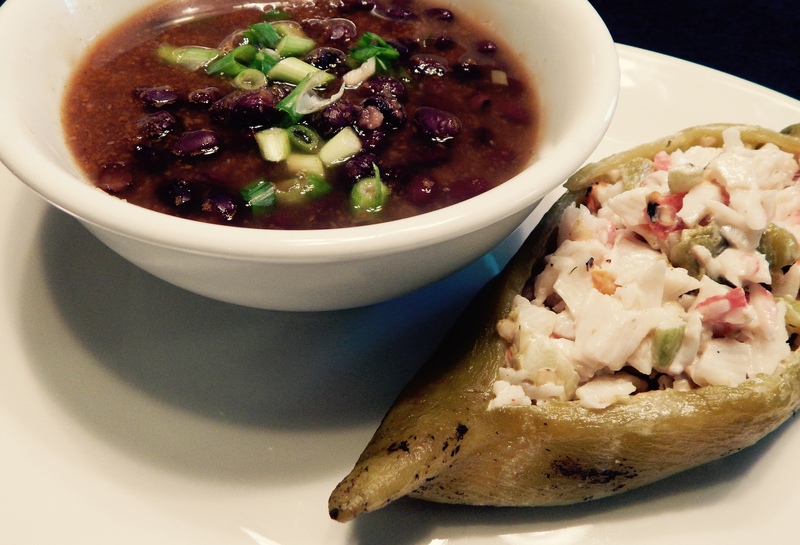 Jim’s Chipotle Black Bean Soup with a side of Krab Salad stuffed long green chile served cold. I had lunch at the Corner Bakery Cafe the other day. I had their Sriracha Black Bean Soup. It was so good I wanted to lick the bowl. Rich and savory with just the right hint of cumin. I decided to try to make it at home. Of course, I came up with some ideas about how I might make my own version rather that try to exactly replicate theirs. And, I wanted an appropriate side dish, so the gears were really humming as I strolled through the market. I decided to use Cholula Chipotle Chile Sauce instead of Sriracha in the soup. I bought a favorite krab and green chile salad from the deli to stuff a roasted long green chile and made a cool relleno on the side to complement the hot soup. I keep peeled roasted green chiles in my refrigerator almost all the time. 1 large clove garlic, diced and smeared with a pinch of salt in to a paste using the side of your knife blade. This technique works well when adding garlic into any dish. You don’t get the little pieces of diced garlic as a surprise in some bites. 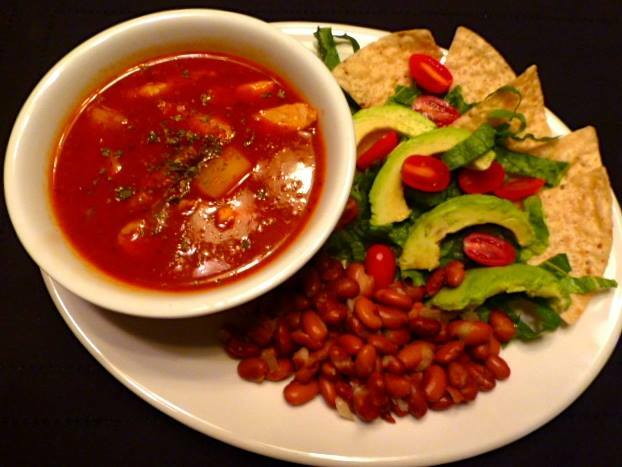 1-1/2 tablespoons Cholula Chipotle Sauce or more to taste. You could also use the adobo from a can of chipotle chiles, but it would not have the same flavor as the bottled sauce. A sofrito is like a mirepoix – a simmered mix of aromatic vegetables the make a flavor base for a soup or other dish. I ran my diced vegetables through my electric chopper to make a very fine dice so they would cook. Simmer the vegetables in a cup of the chicken broth until tender and most of the broth has been taken up. If needed, add a little water to be sure they are very tender. Remove from heat and let cool. You are going to return them to the chopper and it will make a steamy mess if you put them in while too hot. While the sofrito cools, heat the black beans in the remaining chicken broth and water, add the garlic, cumin and chile sauce and a good pick of sliced scallion and simmer. When the sofrito has cooled a bit, return it to the food chopper, add a little water and purée it. You can also use a food mill or your blender. Add the sofrito to the bean mixture, stir well and let simmer so it can thicken the soup. 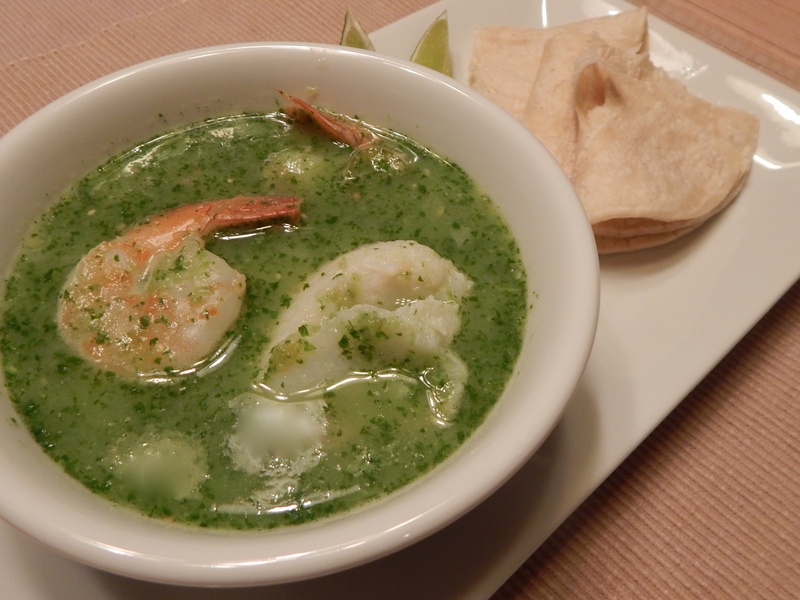 If you want a wetter soup, strain the sofrito and use only the liquid. It’s a matter of personal taste. 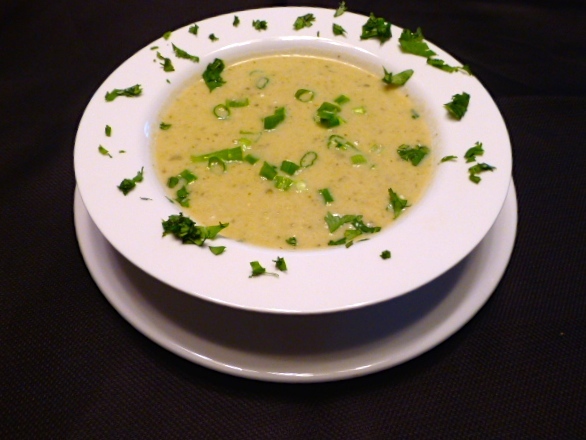 When the soup has thickened, dish it up and garnish with sliced scallion. I bet the soup would have been better the second day if there had been any left to keep. 1/2 lb deli krab salad (my deli make four kinds, I prefer the one with green chile. 2 roasted and peeled long green chiles, stems on. Slit the long green chiles on one side and carefully stuff them with the krab salad. Keep refrigerated until ready serve. It’s the old What’s on Hand and Whats at the Deli Challenge!!!! In the mood for something seafood, but holding out for grilled salmon on Friday night. What to do? Ah, there are KrabKakes at the grocery’s meat block. Tasty, even if a crab never came near them. Smear some tartar sauce on them and it is even more of a treat. But still not seafoody enough, so in the pantry there were a couple of cans of chopped clams, a couple of small potatoes in the basket and, in the fridge, some Better Than Bouillon Fish Base, some celery, half an onion and about 1/4 cup of heavy cream. 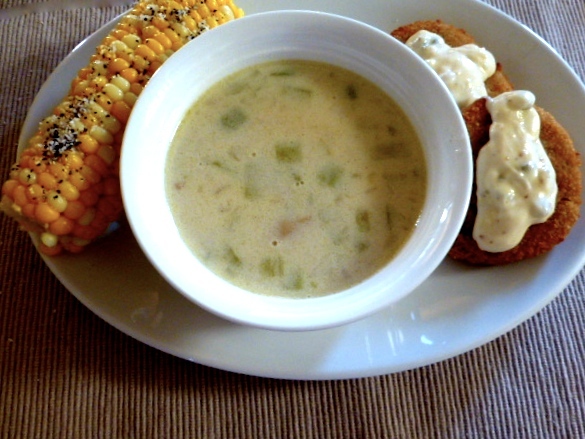 Sounds like an approximation of clam chowder might save the day or evening as it were. Surprise! There were a couple of ears of corn hiding in the veggie drawer. Chop and sauté the onion until soft. Dice the potatoes and celery so they’ll cook quickly. Add water and fish base per label instructions and stir until mixed. Add potatoes and let them cook until soft, the mash about half in the pot so the broth will thicken. Add two cans of chopped clams and their juice and simmer a few minutes. There should be about 1-1/2 cups of liquid at this point. In a two cup measure, mix cream and plain milk to get a half cup or so. If you’re like me, you add a healthy pat of butter to compensate for diluting the cream. Take some hot broth from the pot and add it to the cream mixture to melt the butter and help keep the cream from breaking. Turn off heat and add cream mixture to the hot pot and stir in. Serve with the KrabKakes and boiled corn on the cob and pretend you’re in New England for a little while. Be grateful you are only having wind in dust in West Texas and not the storms in the north, east and south. Keep the storm victims in your thoughts and prayers. Good friend Karen Garcia shared her new cookbook Seasonal Southwest Cooking by Barbara Pool Fenzl of Phoenix with me. It is beautiful book full of exciting recipes and wonderful southwest photos. It is costing me a fortune in ink and paper to copy all the recipes that sound so good! Yesterday, I decided to try my hand at some of the goodies in the book. I began with a Tomatillo and Cucumber Soup. The combination sounded interesting and it is served chilled. 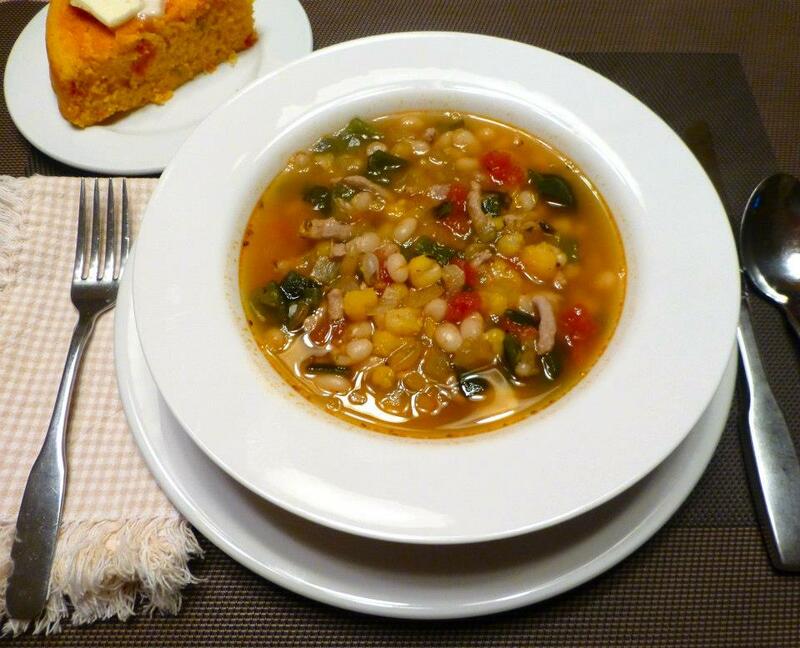 Since we’ve been hitting the 90s this week, a chilled soup sounded very good. Ingredients are onion, garlic, chicken broth, roasted poblano chiles (I had long green chiles in the fridge, so I used them instead.) tomatillos and a peeled and seeded hot house cucumber. After cooking simmering those ingredients until the tomatillos and cucumber are tender, you take the base soup off the heat, and stir in a minced and seeded jalapeño, lime juice and chopped cilantro and let it cool. 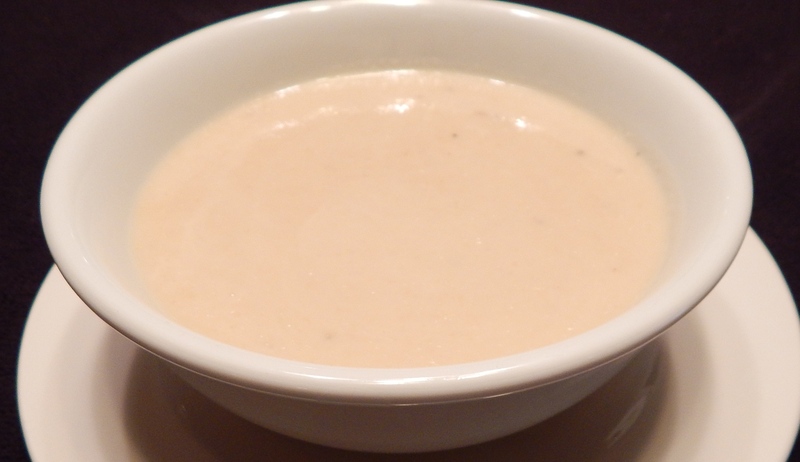 When it is cool, puree it all, stir in a little heavy cream and let it chill for a couple of hours or overnight. Serve it with a sprinkle of chopped green onion and a garnish of more chopped cilantro. It was soooooo gooooooood last night. I can’t wait to try the left-overs today after the flavors have had more time to blend. This Gringo Gourmet is always looking for something new to do with prickly pear cactus. 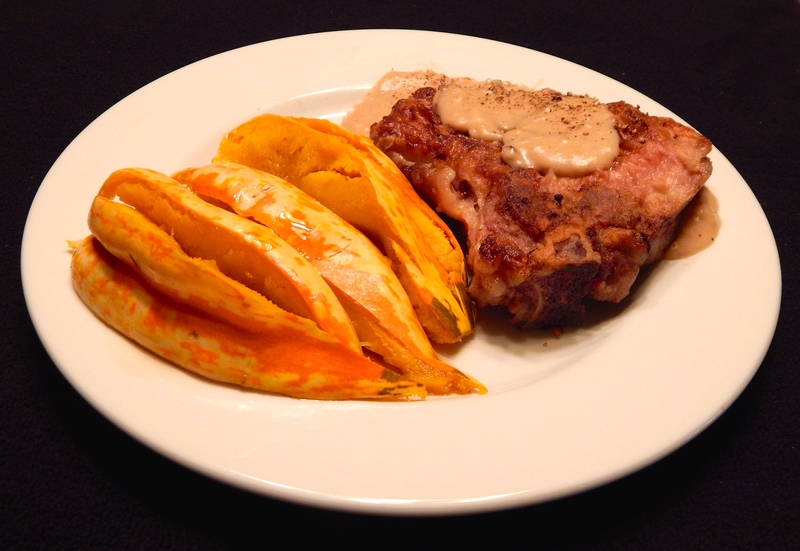 Fenzl has a recipe for an Orange, Jicama and Nopalito (cactus) salad that sounded good. The author used jarred nopalitos. I just can’t do that, so I decided to gamble and try raw cactus in the salad instead. I julienned the jicama (tricky because the jicama is not as solid as you might think), then, I sliced whole prickly pear pads into julienne sticks. I used supremes (individual segments) of small navel oranges. Next time I’ll use larger oranges because they are easier to work with and they will show up more in the salad. The recipe also called for a jar of pimentos. I don’t care much for pimentos, so I left them out and didn’t miss them at all! The salad is dressed with an excellent orange vinaigrette: orange juice, red wine vinegar, olive oil, honey, crushed anise seed and a tiny dash of cayenne pepper and salt and black pepper to taste. It would be a lovely dressing on any salad. 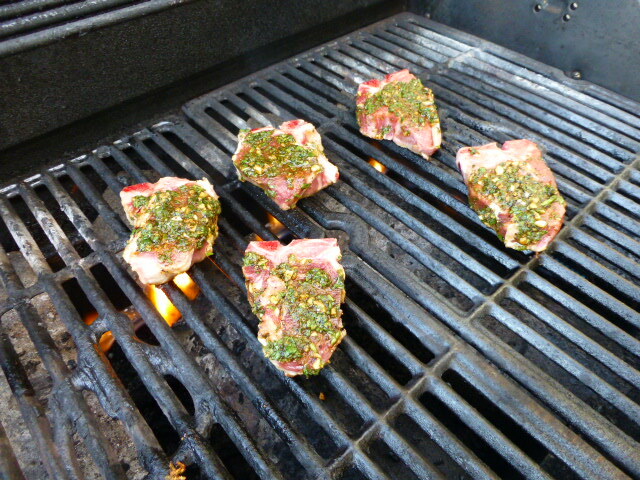 By chance, I had taken some lamb loin chops from the freezer to thaw a couple of days ago. I had to try the Spicy Lamb Chop recipe. The recipe is for a rub with garlic, coriander, cayenne pepper, salt, cilantro and olive oil. I grilled the chops to medium rare. 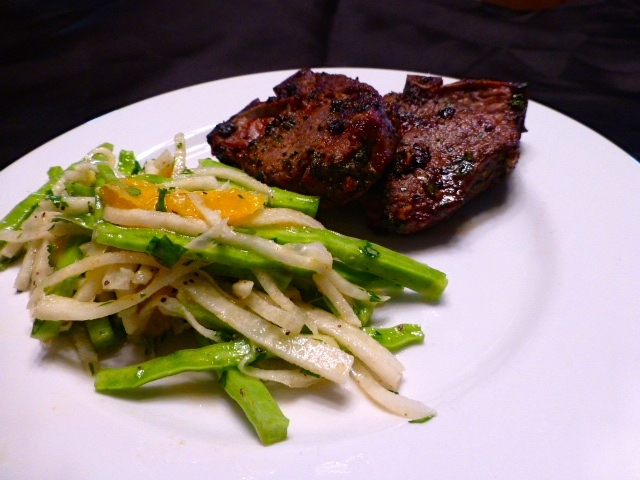 The spicy savory lamb chops were perfect with the crispy and slightly sweet salad. I have enjoyed using Better Than Bouillon Beef Base for quite some time. When you don’t have time to roast bones and make stock, it can add a rich depth to soups, stews and sauces. 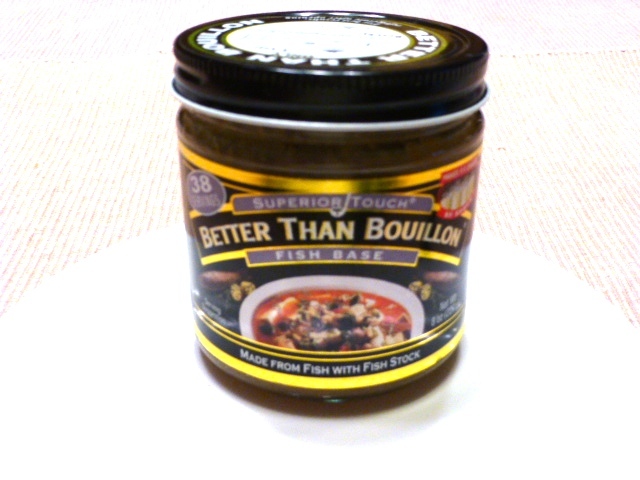 Yesterday, I discovered that Better Than Bouillon has a new Fish Base. I know of only one place in El Paso that carries canned fish stock and I didn’t want to drive that far . I tried the Fish Base and I am delighted with it. 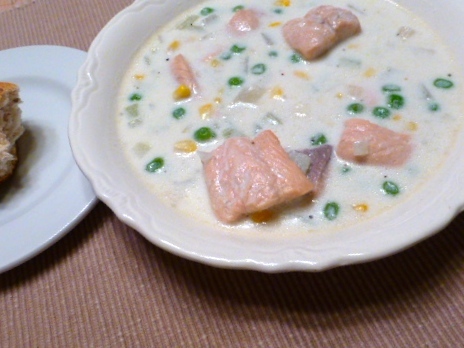 I used it to make this satisfying Salmon Chowder. I couldn’t find my recipe from a magazine, so I created my own version. Barely visible on the side is a chunk of multigrain baguette for sopping up the rich chowder. Heat oil in a stock or soup pot. Sweat onion and celery until onion is translucent and celery is soft. Mix Fish Base into water. Add water to pot. Add potatoes. Cover and cook until potatoes are tender. Add wine and simmer a couple of minutes more. Add peas and corn and bring back to a simmer. Add salmon chunks and simmer about 5 minutes until done but still firm. Gently stir in half and half to blend with fish broth and come up to a slow simmer. Salt and pepper to taste. Serve with a chunk of multigrain baguette and butter on the side. 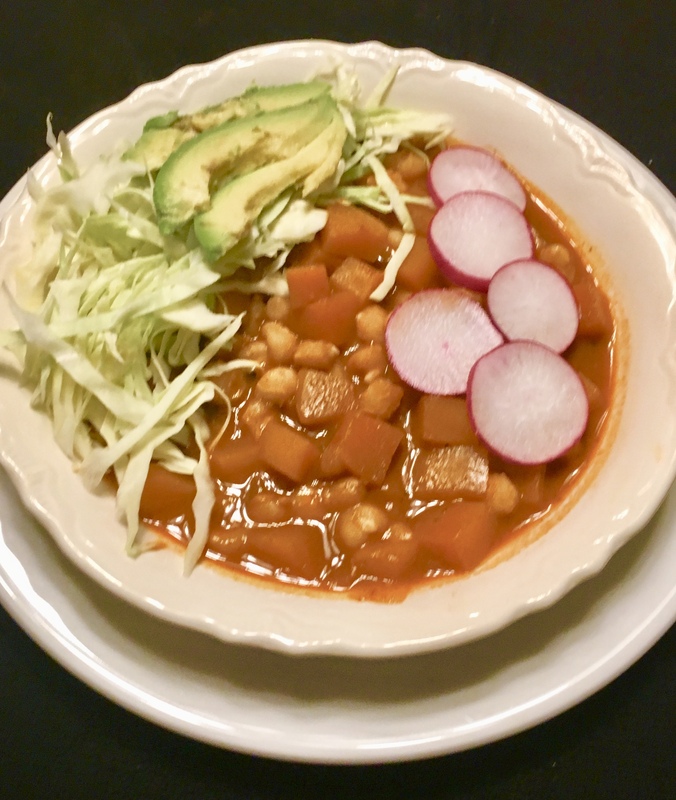 Winter has me craving chile in all forms. Last night, it was chile colorado – pork loin braised in red chile sauce with potatoes added for just enough time to cook before serving. Sides? Beans and salad and a few tostadas for crunch!